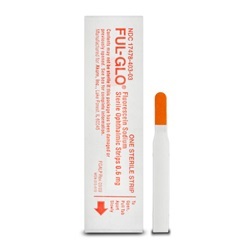 Ful-Glo Fluorescein Sodium 0.6mg topical dye strips. Sterile strips are individually wrapped with orange dye. Manufactured by Akorn. NDC Number: 17478-403-03. Comes 300 strips per box.